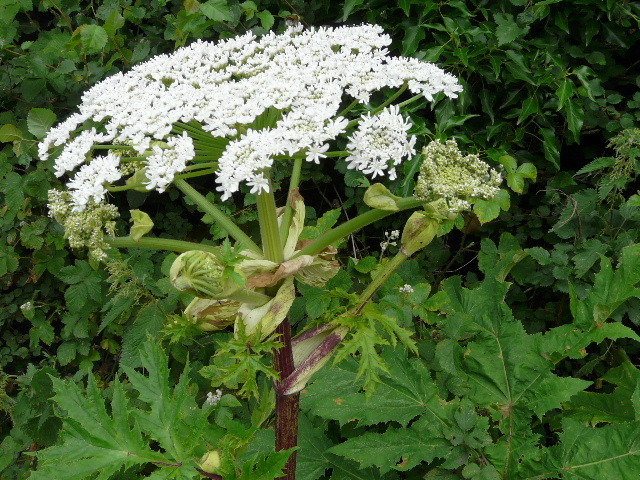 Giant Hogweed (Heracleum mantegazzianum), was reported in the Independent this morning as being the cause of a child being injured. The small child was playing outdoors when they came into contact with this invasive monster. Giant Hogweed, a member or the carrot family Apiaceae, was brought to the UK from Central Asia in the 19th century to be planted in ornamental gardens. It can grow to a massive 3-6 metres tall and can be found in expansive groups along waterways, forest paths and heathland. • Its stems are bristly with purple-reddish markings, or fully purple. 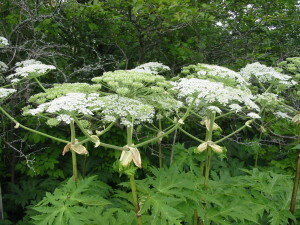 • The flowers are large (up to 60cm) white, flat-topped clusters. • The leaves are deeply lobed with a light green colour. The danger from this plant is in the sap that releases a chemical which causes photo dermatitis. This makes the skin sensitive to sunlight and other sources of ultraviolet light. It is that sensitivity that causes the skin to blister, burn and become pigmented within 24 hours. It can also causing long-lasting scars with the blistering re-occurring for many years. The plant releases the sap by the unwary brushing against or touching it. Beware that if the sap comes into contact with the eyes, it can cause temporary or permanent blindness. Our guidance is to wash the area with soap and water, and if a rash develops seek medical attention. 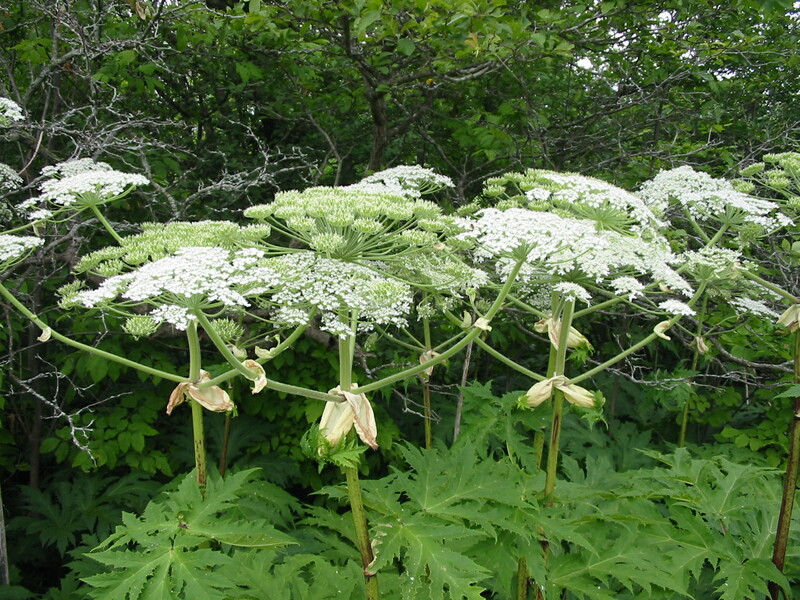 However, because Hogweed can grow so large and in impenetrable groups, we suggest you don’t try and make your way through or cut down Hogweed unless you are wearing protective clothing and even breathing apparatus. Finally, as the plants numbers are increasing, we feel you should educate your children and family members so they can safely avoid the danger. Thanks to Paul Kirtley for his blog and video on this subject.